BookCAT is a fully featured book organizer database which will help you catalog a book collection of any size. Book lovers, churches, schools, clubs and business libraries all over the world are discovering that it is not necessary to spend thousands of dollars to get a sophisticated inventory manager that will keep track of a large (or small) book collection. BookCAT includes a report designer that lets you create professional looking reports. ...... of pages, editor, original title, translator, binding, edition, type of book (fiction, non-fiction, etc. ), category and sub-category, purchase date and price, current value, condition, status (own, want, for sale), personal rating, owner, location, keywords, awards and nominations, comments, synopsis, reviews, and more. You can effectively find the information you are looking for by using the powerful search and filter features. 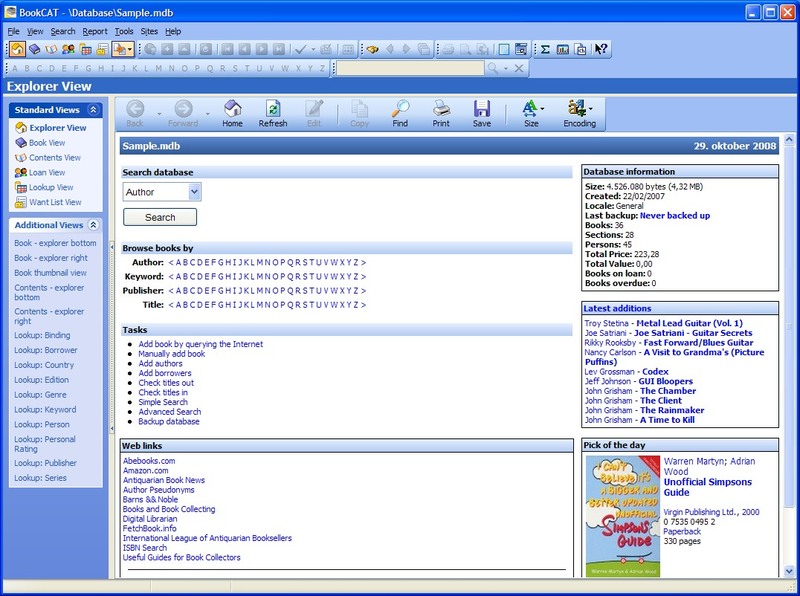 BookCAT allows you search your database with any combination of data fields and operators. Qweas is providing links to BookCAT 10.01 as a courtesy, and makes no representations regarding BookCAT or any other applications or any information related thereto. Any questions, complaints or claims regarding this application BookCAT 10.01 must be directed to the appropriate software vendor. You may click the publisher link of BookCAT on the top of this page to get more details about the vendor.